The Kitakyushu Forum on Asian Women (KFAW) was established in October of 1990 with a special government fund for revitalization project. In 1993, the Forum was recognized as a Foundation by the Ministry of Labour (the present the Ministry of Health, Labour and Welfare). The purpose of our Foundation, through various projects, is to promote the improvement of women’s status as well as their mutual understanding and cooperation in Asia. KFAW fosters citizens’ participation through grassroots activities related to Asia. KFAW studies and researches broadly, deeply and comprehensively women’s issues. KFAW is contributing to “Gender Equality, Development and Peace” while respecting the diversity of Asian cultures. The official name of Asia Josei Kooryuu Kenkyuu Forum in English is Kitakyushu Forum on Asian Women (KFAW). Below is this organization’s symbol mark. Our new symbol represents a combination of “A” and “a”. The “A” is for Asia and the “a” is for advancement. 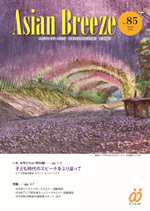 Their combination symbolizes cooperative growth in the advancement of Asian women. Its image is infinite potential. Orange refers to the sun, women and Asia. Green refers to nature, intelligence and delightfulness. Since 1992, in a bid to improve the status of women mainly in the Asia-Pacific region, KFAW has held an annual seminar with the theme “Gender Mainstreaming Policies.” The seminar is commissioned by JICA. In 2002, KFAW was awarded the Special Merit Prize for International Cooperation by JICA. The seminar has attracted many government officers responsible for gender policies: 391 officers from 93 countries (as of September 2018). After studying gender mainstreaming policies in Kitakyushu, they are now very active all over the world. At KFAW, we promote our activities not only in Kitakyushu but also in other areas of Japan and overseas, serving as a bridge between women in Kitakyushu and in other parts of the Asia-Pacific region. Since 1995, when we received observer status to participate in the United Nations Commission on the Status of Women (CSW), we have participated in the CSW as an observer. In July 2002, KFAW became the first non-government organization (NGO) based in the Kyushu region to acquire NGO Special Consultative Status to the United Nations Economic and Social Council (ECOSOC). 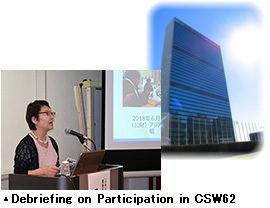 As NGO with this status to the United Nations ECOSOC, KFAW has provided Kitakyushu citizens with opportunities to participate in the United Nations CSW held in New York in March every year. KFAW has also participated in the United Nations High-Level Political Forum (HLPF) with the same status. KFAW shares the knowledge and information obtained from attending these CSW and HLPF with the citizens by conducting briefings and seminars. In November 1992, in order to support the United Nations Development Fund for Women (UNIFEM), KFAW established the UNIFEM Japan Committee under cooperation with the Liaison Committee for the International Women’s Year and the Yokohama Women’s Association. KFAW then became a full member of the UNIFEM Japan Committee. In July 1994, KFAW began to play a role as the secretariat of UNIFEM Kitakyushu, a regional committee that provided support to the UNIFEM Japan Committee. In January 2011, UNIFEM was renamed as UN Women. In response, in April 2011, the name of UNIFEM Kitakyushu was also changed to Kitakyushu Committee of Japan National Committee for UN Women (UN Women Kitakyushu). For the purpose of considering the problems of women in Asian countries and promoting the empowerment of Asian women through mutual understanding and international cooperation, we hold the Kitakyushu Conference on Asian Women annually. With some presenters invited from overseas, the Conference includes lectures, panel discussions, and breakout sessions. KFAW has established networks with overseas gender-related organizations. Through the conclusion of exchange agreements and other activities, we promote interaction in order to share problems and experiences regarding gender equality in Japan and other Asian regions. KFAW serves as a special designated body to manage the Kitakyushu Municipal Gender Equality Center (MOVE). Since fiscal 2011, we have acted also as a special designated organization to manage Kitakyushu Women’s Community Centers (in Seibu and Tobu areas of Kitakyushu).